To those who are committed to their lawns fifty weeks of the year, the next eight weeks are two of the most important. Why? Because fall fertilization, in the estimation of most turf experts, are the two most important “feedings” of the entire year. Here’s why. In the spring added nitrogen usually contributes most to growth above ground, and excessive clippings when you mow. But in fall, due to the shortening of the days and sunlight, that added nutrition is readily absorbed by plants and translated to the roots, making them stronger and more vital as the winter dormant season approaches. 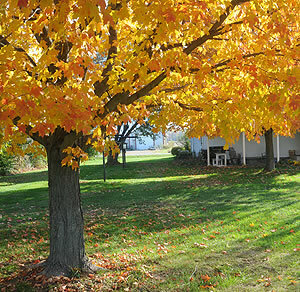 It’s true that an October feeding will often give you the most color and best looking lawn of the year, and time to enjoy it most with the changing color of trees and landscaping. And then an additional feeding in November (even early December, before the ground freezes) will ensure that your lawn will come back in optimal shape for a healthy, green start in the spring. And now’s the time to do it!